The holidays are often filled with time-honored traditions that include some of our favorite meals and foods. 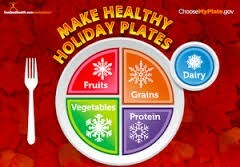 As you celebrate, think of little changes you can make this holiday season to create healthier meals and active days. An added bonus, these small changes may help you to avoid those extra holiday pounds we all fear each year. Happy Cooking! • For gravies or sauces — if you are making pan gravy, first skim the fat off pan drippings. For cream or white sauces, use fat-free (skim) milk and soft tub or liquid margarine. • For dressings or stuffing — add low-sodium broth or pan drippings with the fat skimmed off instead of lard or butter. Use herbs and spices and a whole grain bread for added flavor. • For biscuits — use vegetable oil instead of lard or butter and fat-free (skim) milk or 1 percent buttermilk instead of regular milk. • For greens — use skin-free smoked turkey, liquid smoke, fat-free bacon bits, or low-fat bacon instead of fatty meats. • For sweet potato pie — mash sweet potato with orange juice concentrate, nutmeg, vanilla, cinnamon, and only one egg. Leave out the butter. • For cakes, cookies, quick breads, and pancakes — use egg whites or egg substitute instead of whole eggs. Two egg whites can be substituted in many recipes for one whole egg. • Use unsweetened applesauce or mashed ripe bananas instead of butter. • Try cutting the amount of sugar listed in recipes in half. • Use spices to add flavor such as cinnamon, allspice, or nutmeg instead of salt. • Try baked apples with cinnamon and a sprinkle of sugar instead of apple pie. • Invite your guests to make their own parfait with colorful sliced fruit and low-fat yogurt. • Take off poultry skin before eating. • Drain off any fat that appears during cooking. • Chill meat and poultry broth until fat becomes solid. Skim off fat before using the broth. • Skip or limit the breading on meat, poultry, or fish. Breading adds fat and calories. It will also cause the food to soak up more fat during frying. • Choose and prepare foods without high fat sauces or gravies. • Start with a lean choice. • The leanest beef cuts include round steaks and roasts (round eye, top round, bottom round, round tip), top loin, top sirloin, and chuck shoulder and arm roasts. • The leanest pork choices include pork loin, tenderloin, center loin, and ham. • Boneless skinless chicken breasts and turkey cutlets are the leanest poultry choice. • Choose extra lean ground beef. The label should say at least “90% lean.” You may be able to find ground beef that is 93% or 95% lean. • Processed meats such as hams, sausages, frankfurters, and luncheon or deli meats have added sodium. Check the ingredient and Nutrition Facts label to help limit sodium intake. • Lower fat versions of many processed meats are available. Look on the Nutrition Facts label to choose products with less fat and saturated fat. • Use a nonstick pan with vegetable cooking oil spray or a small amount of liquid vegetable oil instead of lard, butter, shortening, or other fats that are solid at room temperature. Enjoy the Food, Fun, Friends and Family! • Quench your thirst with low-calorie options. Drink water with lemon or lime slices. Offer seltzer water with a splash of 100% fruit juice. • Laugh, mingle, dance, and play games. Focus on fun and enjoy the company of others. • Spend time providing foods or preparing meals for those who may need a little help. Give food to a local food bank or volunteer to serve meals at a shelter during the holiday season. Giving back is a great mood booster. • Make being active part of your holiday tradition. Have fun walking and talking with family and friends after a holiday meal. Give gifts that encourage others to practice healthy habits such as workout DVDs, running shoes, and reusable water bottles. • Create delicious new meals with your leftovers. Add turkey to soups or salads. Use extra veggies in omelets, sandwiches, or stews. The possibilities are endless! Be sure your family and friends enjoy the food and fun, but focus on the time together. Remember this season is all about the memories, not just the food. You will feel better and enjoy your holiday time with less worry if you focus on staying healthy this season.